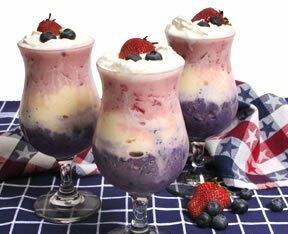 Strawberries, blueberries, and frozen yogurt make this delicious, colorful red, white and blue dessert. It is perfect for your 4th of July celebration or any special summer get together. This is just one of the many summer fresh Blueberry Recipes we have to offer. Use our completed guide on making homemade ice cream for a special treat to serve this 4th of July. Learn how to create this beautiful watermelon basket for a unique way to serve fresh fruit at your 4th of July celebration.